Naomi Blake (née Dum) was born on 11th March 1924 in Mukaĉevo, Czechoslovakia. The youngest of ten children, she was originally named Zisel (meaning sweet) by her parents. In 1942, Naomi’s immediate family included 32 members: four grandparents, her parents, nine siblings, six spouses and ten young nieces and nephews. By 1945 only eight members remained; the rest had been murdered during the Holocaust. She survived Auschwitz and Brannau concentration camps and after the war made her way to Palestine where she changed her name to Naomi and fought in the War of Independence. This year on Yom Hashoah, Naomi’s daughter, Anita will relate her mother’s story and introduce Naomi’s sculptures, which express her experiences. Her work is principally optimistic and positive. 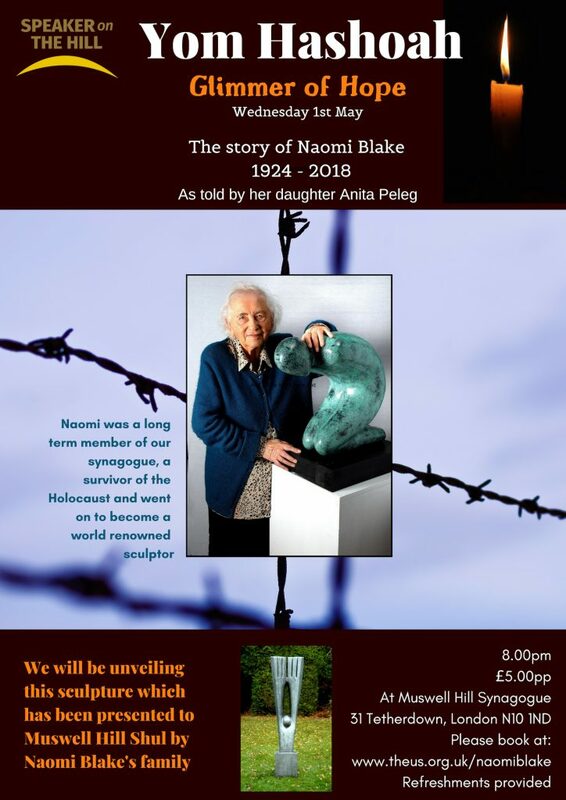 It stands determinedly to help keep alive the legacy of the six million slaughtered Jews, as well as promoting Naomi’s vision for uniting faiths, building understanding between religions and her hope for the future. At the end of Anita’s talk, one of Naomi’s sculptures will be unveiled and candles will be lit to remember the six million Jews.